Skye Hussain on Who IS This Guy? According to a recent posting in the personals section on Craigslist, Vernon Heywood is a fun loving car enthusiast born in Torrance, California and in addition to the usual B.S. about enjoying long walks on the beach and holding hands at sunset, is really much more interested in all aspects of cars from Hot Wheels to Unimogs and from rat rods to concours cream puffs. Thanks to his extensive Hot Wheels collection, he is often accused by his family of being solely responsible for keeping Mattel in business. Of course, most often his family abandons him as he can spend more time at a car show than GM can spend fixing faulty ignition problems. While he can’t claim to have been born in the backseat of a car, it’s speculated he was most likely conceived there. It was the ’60s, that’s what kids did then. 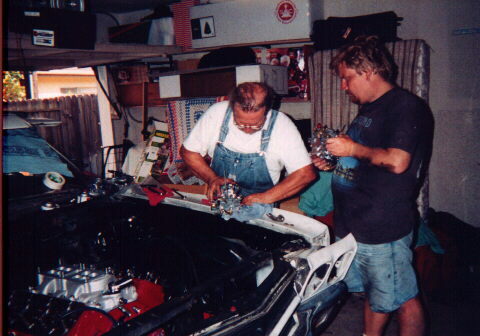 His father, a Chevrolet man through and through, owned a ’62 Chevy at the time Vernon was converted from a twinkle in the eye to a bun in the oven and nine months later, yet another car guy joined the Heywood clan. At age 5, Vernon began pumping gas and operating the hydraulic lifts at his grandfather’s service station, Harry’s Richfield, later Harry’s Arco, on the corner of Crenshaw and 182nd St. in Torrance, California. He’d send his grandfather into a coronary every time he clicked the gas pump off a half cent too late, and by age 6 had crashed a Jaguar MK1 into the roll away diagnostics equipment cabinet. No wonder his grandfather eventually died of a heart attack. And to think, he was the good kid. His father was a mechanic at the station and frequently bought and traded cars that came into the shop for service which often meant a different car in the family driveway every week. Thanks to his father’s bargaining ability Vernon got to experience the joys of having the wind whip through his hair in the back of a pickup truck; playing Batman and running up the back of a ’56 Corvette to jump into the driver seat; driving an incomplete hand built custom hot rod around his grandfather’s station at age 6; riding atop the center armrest of a ’68 Cadillac; and sitting in the rear facing seat of a Country Squire station wagon. Vernon was exposed to all manner of vehicles and quickly became a “Jedi-master” of the automotive set. His training could not have been more complete if his last name had been Skywalker. The Heywood’s enthusiasm for all things automotive resulted in many warm summer nights at Lion’s Drag Strip as well as Ascot Park where his dad frequently raced at both venues—in addition to a few illegal ones. His father’s racing days ended when he unintentionally did his impression of the Human Torch while racing a go kart. Luckily, the family’s love for cars was not extinguished with the flames of the accident, it just took on more of a spectator roll—at least until Vernon got a driver license of his own. In 1982, Vernon began following in his father’s footsteps, and spent his summer nights terrorizing the streets of Tustin, California in a beat up, but much loved 1968 Camaro. His father bought him the Camaro, and Vernon still wonders to this day what the hell his dad was thinking. An unsupervised 17 year-old in a muscle car? If his father knew half of the events that transpired in that car, he’d have joined Vernon’s grandfather in the hereafter at a much earlier age. But Vernon would never have told his father this, he was having too much fun—at least for as long as the Camaro survived being a target for every incompetent moron with access to a set of car keys within the Tustin city limits. The primered gray and dark green beast was rear ended, clipped and finally put out of its misery by unceremoniously being T-boned by of all vehicles, a Mercury Capri—a fate no car should have to endure. Since then, Vernon has been the black sheep of a GM loyal family. To this day, the Camaro is still the only GM car he has ever owned. Since the demise of the Camaro, he’s owned several Cal Custom VW Beetles, and restored a 1979 Fiat Spider 2000 before moving on to four-wheel-drive vehicles. All were modified to do more than they were originally intended and kept running well past their prime. Of course, that may not be saying much since most didn’t come into his possession until they were already well past their prime. Vernon still managed to be involved in the Chevrolet scene despite not owning one himself. He and his father owned and maintained a flat bottom drag boat powered by a Chevrolet 427 engine with a GMC 6-71 blower. His father also owned and required occasional wrenching assistance on a 1978 25th Anniversary Edition Corvette, and they built up and restored a 1970 Chevelle SS, aka “Mercy,” before his father retired to Florida. Although, he still harbors a deep lust for horsepower and speed, Vernon has spent most of the last twenty years away from racetracks, dragging his friends’ Jeeps over the four-wheel-drive trails of California, Nevada, Arizona and Utah behind his modified 4x4s—primarily Suzukis—a 1988 Samurai and a 1993 five-door Sidekick. The Suzukis were followed by a 1949 Willys Station Wagon, a 1966 International Harvester Scout 800, and now a pair of Toyota 4Runners, 1993 and 1997. 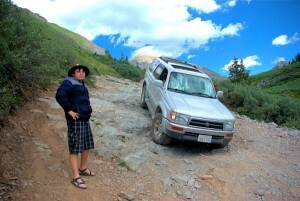 Vernon Heywood on Black Bear Pass in Colorado passing the automotive gauntlet onto his son. His passion for lifted and locked vehicles comes primarily from learning exactly what roads a Fiat Spider was incapable of navigating while on camping trips. Believe it or not, it did surprisingly better than you’d think. Despite being labeled an off-road enthusiast, which in most So. Cal. Circles translates to “beer chugging bunny killer and general menace to society” (only the latter of the three is true as he never drinks while driving and actually rescued a rabbit from certain death who lived with him for many years), Vernon is still passionate about all things automotive and is much more likely to turn his head to catch a better look at a beautiful car than a pretty woman. He began his writing career as the editor-in-chief for the Katana, a magazine produced for the American Suzuki Association. He’s also worked as a road test editor for Autobytel Inc. and has written and managed “how-to” and “parts and accessories” advice columns for MyRide.com. After heading the editorial department for TK Carsites and later KPA, managing an extensive blog network as well as onsite marketing content for dozens of automotive dealers, Vernon now works as a freelance writer for various sites across the web. His work can and should be avoided at Amazon.com, About.com, and Examiner.com where he is currently the 4WD and Pickup Examiner for L.A. That’s right, they pay him to be a menace. Vernon currently lives in Santa Ana, California with his best friend and roommate, and his son whenever he can. When he’s not writing or wrenching on his 4Runner, he can be found frequenting classic car and hot rod shows and milling about junkyards looking for that next great hunk of junk that will make his other cars jealous. 10 Responses to Who IS This Guy?